Rereading it in anticipation of a group read. It's been a while, and I'll be interested (if no one else) in how I like it. I finished rereading this book the other day. I first read the book about 25 years ago, probably soon after reading Le Guin’s Earthsea trilogy, and I’ll admit that as a 13-14-year old much of it went right over my head (at least on a conscious level) so I’m glad I took the opportunity to read it again for a group discussion. As Le Guin notes in regard to writing this novel, it’s a thought experiment: What kind of societies would evolve if a human species existed without distinctions of gender? What would remain that would be recognizably human? On the world of Gethen, humans are androgynes who spend the majority of their lives as neuters. Periodically, like a menstrual cycle, they enter kemmer, or estrus, and become sexual, hormones determining who becomes the male or female in any particular pairing. Genly Ai is the Ekumen’s (more on this below) first ambassador to Gethen, and he struggles to understand these people as he paves the way for their joining the society of human worlds. 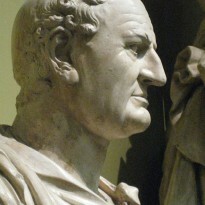 The action of the novel focuses on the relationship between Genly and a Karhidish politician, Therem. Karhide is one of two rival societies that dominate the planet, the other being Orgoreyn. Karhide is a feudal state, uncentralized and hardly worthy of the name “nation”; the Orgota have created (for the first time in Gethenian history) a centralized, nation-state easily recognizable to a modern reader (think communist Russia – bureaucratized mediocrity, secret police (the Sarf) and gulags (Pulefen Camp)). Therem is exiled and flees to Orgoreyn. Genly falls out of favor at Karhide’s court and winds up in Orgoreyn, where his inability to understand the Gethenians lands him in the aforementioned gulag. Therem breaks him out of jail and the rest of the novel is an epic journey as the two cross a glacier to return to Karhide. Laid out like that I do the novel a great injustice but that’s essentially what happens. It’s Le Guin; there’s no way I can’t recommend it. If you are an SF fan and you haven’t read any UKL – shame on you! Go out immediately and buy, borrow or steal one of her novels, essay collections or poetry! 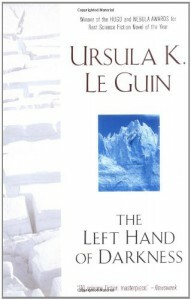 * “The Ekumen” - The Left Hand of Darkness is part of Le Guin’s future history – The Hainish Cycle. Two million years ago, the Hainish colonized this part of the galaxy, leaving behind numerous colonies of humans (including Earth) before their society collapsed. Now, many of these humanities have advanced to the point that contact is being reestablished and an organization (not a government, more an organizing body) has emerged – the Ekumen – to facilitate contact. There’s a means of instant communication – the ansible – but physically, humans are limited to nearly-as-fast-as-light (NAFAL) ships so interstellar empires are impossible.